As the holiday and shopping season has officially begun, the newest smartphones will be competing head to head. This includes the latest flagships from HTC and LG. 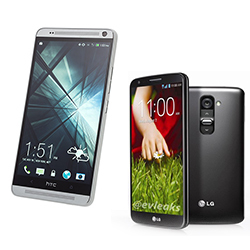 The One Max and LG G2 are two smartphones with very unique and distinctive features. While the One Max is one of the biggest phones out there, with its 5.9 inch screen, LG G2 has some remarkable new features. We’ll see which one is more likely to be on buyers’ radar this season.